Whole House WiFi: Want to stream more and stress less? Whole House WiFi installed around your home will blanket your home with reliable, expandable WiFi that allows you to fully utilize your smart home products. Lights: You can choose lighting to suit your moon with lights by Lutron Caséta! The lights are brought to life with the touch of a remote, giving you countless possibilities for adding easy control and comfort to how you live your life. Door Locks: The Schlage Sense™ Smart Deadbolt provides a smarter, more convenient way for you to enter your home with just a few taps. No more keeping track of keys, what’s not to love about that? Thermostat: The Honeywell T6 thermostat makes your smart home an even more comfortable home with temperature that can be adjusted from your phone to keep up with your lifestyle. Home Security: A WiFi Ring Video Doorbell with advanced security features and a sleek design allows you to monitor, see, hear, and speak to people at your door from your phone, tablet, or computer. You’ll have extra peace of mind with smart home security! Voice Control: Ready to control all your smart home features with just your voice? Amazon’s Alexa Voice Service through the Echo Dot allows you to do just that! You can also play music, search the web, create to-do lists, shop online, and more. 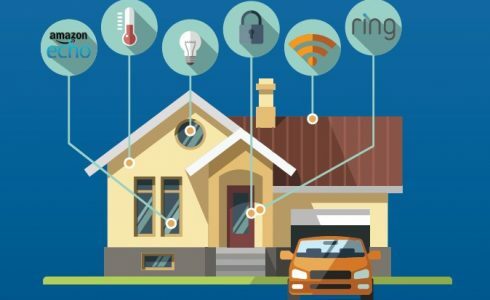 With our SimpliFi smart home package, HHHunt Homes saves you time, energy, money and provides you and your family with better security and safety. HHHunt Homes is proud be to be a smart homebuilder and we encourage you to visit us in Richmond, Williamsburg, Hampton Roads, Virginia, and Raleigh, North Carolina to learn more today!